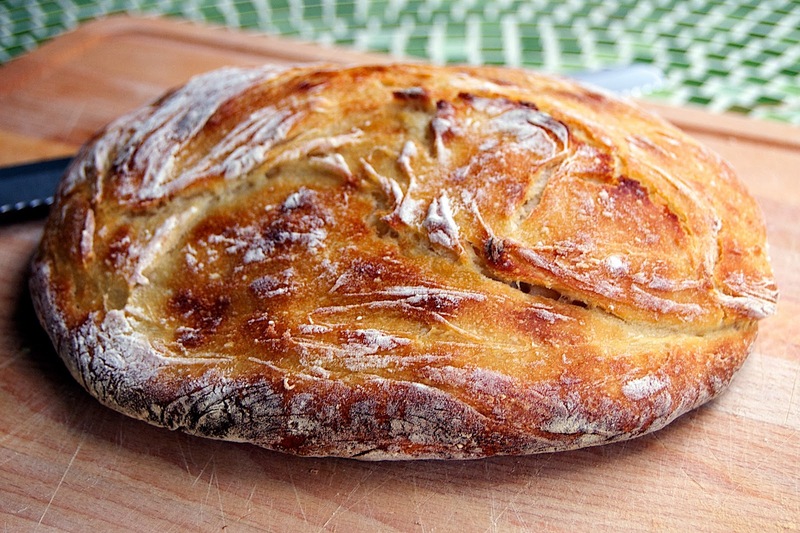 Here is another delicious no-knead bread to add to your repertoire. It's made in a similar fashion as other no-knead breads, but with the your sourdough starter instead of a little bit of active dry yeast. 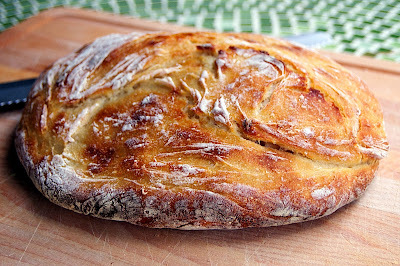 Sometime, hopefully soon, I hope to write a tutorial on sourdough. Sadly, I feel as though I'm a genius on the subject yet and I in no way want to lead you astray. As I have mentioned earlier, the first attempt at a sourdough starter was a little bit lackluster and I had difficulty starting it. I sort of 'cheated' and used a little tiny bit of active dry yeast. I really mean it, MAYBE a 1/4th of a teaspoon, but more like an 1/8th. Then I combined it with some flour and water in a large jar and let it sit. But sit it did not. I came back from class a few hours later (remember, I was making this my senior year of college) and it had exploded all over my kitchen. Well, not technically, but I did had the blob reincarnated. It was spewing out of its jar, onto the counter and I think a little even crawled onto the floor. And I had no idea how to stop it. I remember hearing once (I think it was Alton Brown?) that "yeast hates salt" - i.e. it stops it from growing. It helped, but then it never came alive again. When I made some bread with said starter, it had the right texture but no sour taste. I read more about sourdough and tried to revive it (partially successfully), but it was laid to rest in a plastic garbage pail tomb before my move out west. My current starter, given to me by my friend Ann, is fantastic! So sour! The texture is consistent and it's not fussy! This no-knead wasn't as sour as other loaves of bread that I've made, but it was easy, definitely had a chewier texture and a 'sour' aftertaste. But the crust, OH, the crust… it was wonderful! So thick and with the right amour of crunch. It was wonderful on my sandwich I made for lunch the next day or on the peanut butter toast I made for breakfast the day after. 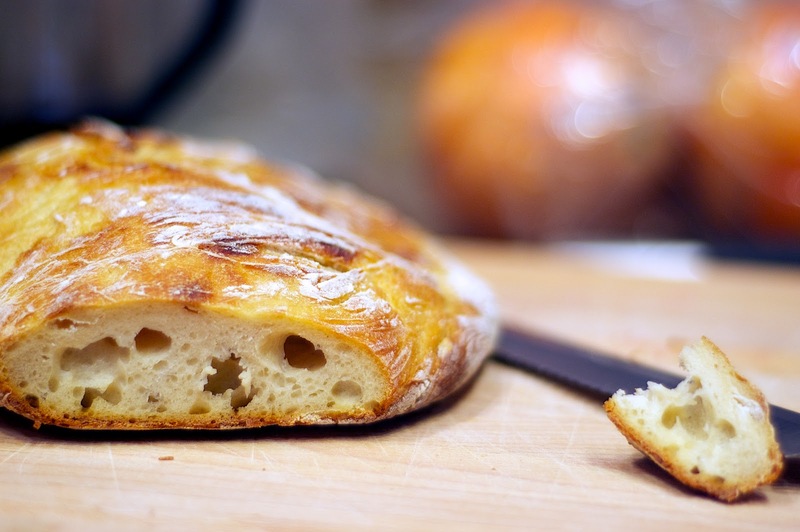 If you're uncomfortable with sourdoughs but want to try your hand at making them, I recommend this recipe! Mix the salt with the flour, and the sourdough with the warm water. Then combine all the ingredients and mix for 20 seconds or just until all of the flour is wet. If you work the mixture, you will have a loaf with a tight crumb. I wanted one that had big air pockets, so I worked it as little as possible. Cover the bowl with plastic wrap and then a tea towel (this helps trap in heat), and leave it to rise at room temperature overnight (about 18 hours). The next day dust the dough with a bit more flour and fold the sides into the middle to form a round loaf, dust a towel with stone ground cornmeal (or coarse salt) and place the loaf onto it seam side down, putting more cornmeal on top then fold the towel over. Let the loaf rise until it has doubled in size again. When the loaf has almost doubled in size, but the dutch oven in the oven and set it for 475 degrees (it is important to put the dutch oven into a cold oven so it doesn't experience thermal shock). When the dutch oven is rocket hot, place (toss) the dough, seam side up, into the dutch oven, and put the lid back on. Bake for 25 minutes, during this time the lid will trap moisture from the dough which will allow the crust to stay stretchy as the bread continues to rise. Then take the lid off and turn the oven up to 475. Take the loaf out of the oven once it is brown and crusty, 15-20 more minutes. I just made this this morning. Instead of baking in a dutch oven, I put a roasting pan full of water on the bottom of the oven. I didn't change the oven temp (and actually, you have only 475 as the temp). Turned out beautifully! I live at 7500 ft elevation, so it's always a miracle when breads actually rise!